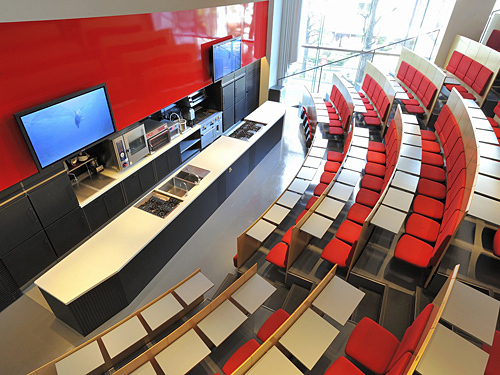 The college offers a variety of classrooms and labs. As a symbol of ANNEXE, lecture theater in 2 story hall. By attaching a steep slope on the seats, it is easy to see step-by-step recipe, and the kitchen is designed to respond various types of recipes. 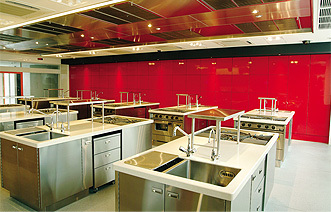 With an outrageous design in Italian red, this facility is also used for demonstrations when famous chefs from abroad and home are invited as guests. A glass walled atelier at 1st floor facing in Meiji St. 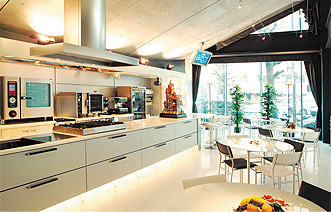 Full-fledged kitchen equipments in open space. 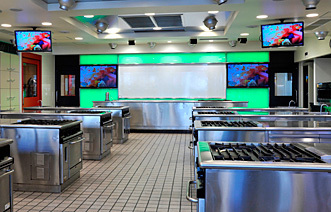 When the instructor demonstrates, the LED panel at the back changes to different colors. By installing the advanced air ventilation system in the ceiling, effective hands-on practices are available. Blight and comfortable kitchens with high ceiling, and red walls become storage spaces.